The 35th National Games of India, was held from 31 January 2015 to 14 February 2015 in kerala. It is the second time that Kerala is hosting the national games after 27th National Games 1987. The mascot of the 35th National Games was "Ammu". The next 36th Games will be hosted by Goa, and the 37th by Chhattisgarh. The final medal tally was led by Services, followed by Kerala and Haryana. Services won 91 golds. secured 22.47% of the total 405 Gold medals. Top 3 teams won 45.68% of total gold medals. Maharashtra is at 4th and Punjab is at 5th place. Sajan Prakash (Kerala ) and Rajina Kiro (Andaman Nicobar) were the top medal winners in men’s and women’s categories respectively. Sajan Prakash won 6 gold and 2 silver. Rajina Kiro won 5 gold and 1 silver. Out of 37 teams 32 teams won at least a one medal. 30 teams won at least one gold medal. Sikkim, Dadra and Nagar Haveli, Lakshadweep, Pondicherry and Nagaland failed to win any medal at the Games. Kerala won 75 more medals than 2011 national games. Kerala, Services and Gujarat won 24, 21 and 10 more gold medal respectively than 2011. 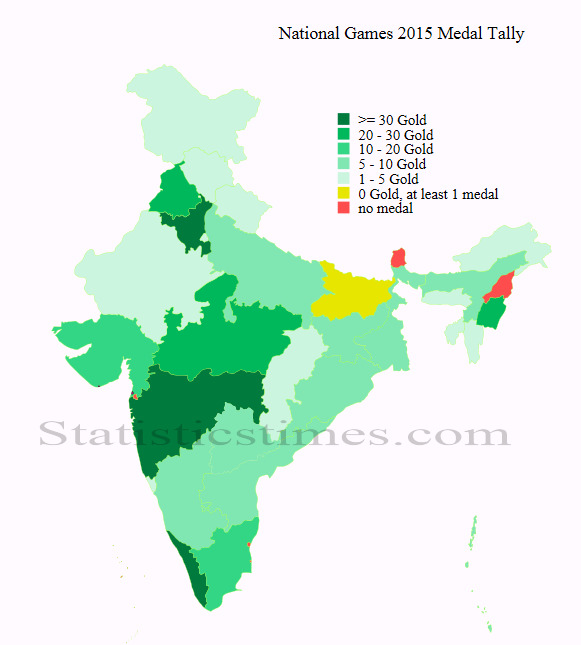 Gujarat is biggest mover in medal tally. Gujarat moves 19 position up from 28 in 2011 to 9 in 2015. Rank of Kerala, Assam, Andaman Nicobar and Jammu Kashmir improved by number 5. Delhi is biggest looser in ranking. With the loss of 53 medals Delhi moves down from 6 in 2011 to 19 in 2015. In 2011 national games, numbers of gold, silver and bronze were 444, 447 and 588.